Portland was the host for the 2012 Olympic and Paralympic Games Sailing Events and justifiably so. It is a spectacular place. Placed in the centre of the incredible English Channel Jurrasic Coast, a World Heritage Listed site, it has one of the largest man made harbours in the world. The area is eight miles from the seaside town of Weymouth on a massive rock that has been described as a northern Gibraltar for it is very like that massive rock in the Mediterranean. 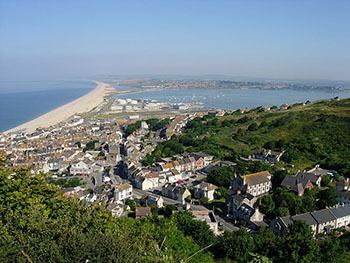 Known correctly as the Isle of Portland it is not quite an island for Chesil Beach connects it to the mainland. Chesil Beach itself, or Chesil Bank as it is also known, is an eighteen mile long stretch of shingle, one of three in the country. The A354 road has a bridge over Chesil Beach to Portland, the only road in. Together Portland and Weymouth are a borough on the coast of the lovely county of Dorset that jewel in the centre of southern England. Portland is only four miles long and one and half miles wide, but it packs a punch for location. See it from the South West Coastal Path on top of the cliffs, stunning!!! The sea area Portland is well known in the British Shipping Forecast along with Dover, Wight and Plymouth covering the English Channel. Probably quite useful during 2012! The Jurassic Coast itself is 95 miles long of incredible scenery and extends from Swanage to Orcombe Point near Exmouth. Portland, among several, is one of the gateway towns to the coast. The coast is well known for its landforms and fossils and Portland Museum is a local interpretive centre. The Jurassic Coast became England's first natural World Heritage Site. One of the world's greatest walks is the stunning South West Coast Path National Trail, part of which passes along the Jurassic Coast. The only road in is the A354. First Group do run a bus service from Weymouth to Portland. Weymouth itself has plenty of public transport in and to the town, local bus, coach and train. Recommended is the delightful bus trip along the coast from Weymouth to Exeter via Lyme Regis. Spend the day exploring the coast from the top of the X53 bus. The building of Portland Harbour started in the middle of the 1800's. The breakwater was largely constructed with stone extracted from the Public Works Quarries at the Grove by Portland prisoners under a very hard labour regime. Some prisoners were trained under this project and later went to Australia where they contributed to building projects there. Many warders at the prison were themselves stonemasons etc. Two warders, brothers, (one of them the head warder) were first cousins of the writer, Thomas Hardy. The harbour and its breakwater today stands as a memorial to the work of both prisoners and warders and nowadays a joy to the modern world. 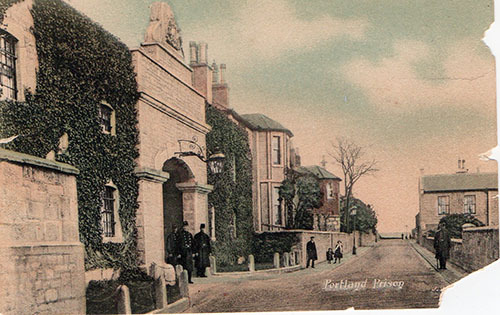 Portland Prison This fascinating old photograph is by courtesy of Portland Grove Prison Museum which is the building seen on the right of the trees on this c1904 postcard. Portland Prison was an important part of the history of Portland. The prisoners were responsible for supplying the stone for the harbour breakwater and many of the buildings seen at the Grove. They rebuilt Portland Prison from 1895 to 1915 using Portland stone. The Grove Prison Museum is located in part of the Deputy Governor's house opposite the main gate of Portland Prison. It has become an interesting museum portraying as best as they can a piece of the original Portland Convict Prison history from 1848 to 1922 when it became a Borstal Offenders Establishment to 1988 and on to being a Young Offenders Establishment. Nowadays the prison's correct title is HMP (Her Majesty's Prison) and HMYOI (Her Majesty's Young Offenders Institute) Portland. The Governor's House was built in 1866, but the Governor's Gardens alongside were laid earlier in 1851. Take it in as you explore Portland. You will find it at the end of Grove Road. It is a short five minute walk overlooking beautiful Portland Harbour and the Breakwater. 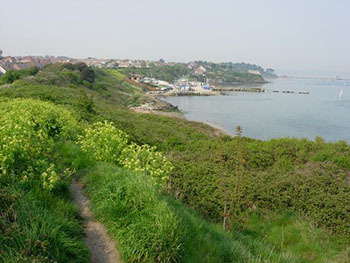 At the other end of the gardens, just past the Borstal Bowling Club is the Jurassic coastal trail. They are open four days a week, Thursday, Friday, Saturday and Sunday from 10am to 2pm. Entry is FREE. Donations are of course always welcome. Portland was chosen to host the 2012 Olympic and Paralympic Games. An ideal choice. The beautiful and large harbour certainly lends itself to the event with its world wide reputation that it has some of the best sailing waters there is. Together with the fact that the Weymouth and Portland National Sailing Academy itself has world class facilities. A massive plus is the stunning beauty of Portland and the rest of the Dorset coast. The location appealed to locals and visitors alike for the event could be viewed free from the coast! 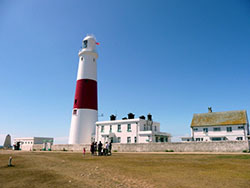 There is accommodation at Portland, Queen Anne's House B & B or the Portland Heights Hotel. If you cannot get in there try Weymouth a delightful venue in its own right. The town is a favourite summer family holiday destination with its sandy beaches and safe swimming. Best book early!!!! You will be so glad you did - Portland is such a lovely place. Check out the right hand column for an easy way of booking a hotel or perhaps self catering. What about a cottage near Portland. Wessex Hotels has accommodation in both Portland and Weymouth including Portland Heights Hotel and Queen's Anne's House. Click the link above and there is a choice on the left lower down for Portland and other places in the area. Please do not leave it too late as choice will then be thin on the ground! Weymouth is the next nearest place if you cannot get in in Portland itself. There is plenty of public transport to Portland. You may not want to stay in the town but the Dorset countryside around. It is an attractive area. Cottages are a very pleasant prospect, come and go as you please.